I made a dining table over the summer for a customer out of ash- it’s pictured in my projects. 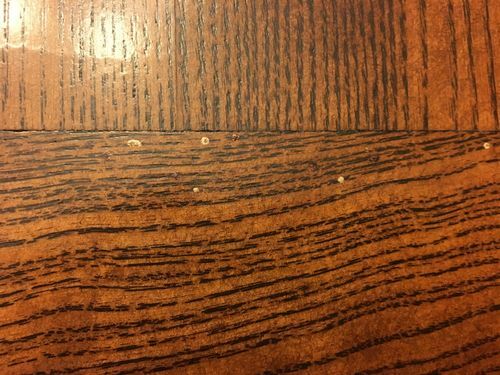 I received an email from her today saying she is seeing small holes with little piles of sawdust on the one breadboard end. She sent some pictures which I have attached here. I got in touch with the local sawyer that I got the ash from and he says that they are powder post beetles that die when they come out, “nothing to worry about” and that they “can’t reinfest”. I’m not feeling as confident as he is. I’ve started some research online and am seeing everything from fumigation to heat being needed to kill them. I’ve seen some other threads on here about powder post beetles but they’re all a few years old. Thought I would see what the latest thinking is for something like this. How would you handle this with a customer? I want to do what I can to make this right for her. She’s one of those perfectionistic customers too. This is a finished 7 foot table. Some of the treatments that I’ve seen are for unfinished wood. And I can’t put this in an oven! Any advice would be greatly appreciated! No direct experience with PPB, but I did some searching and found this from U of Kentucky. 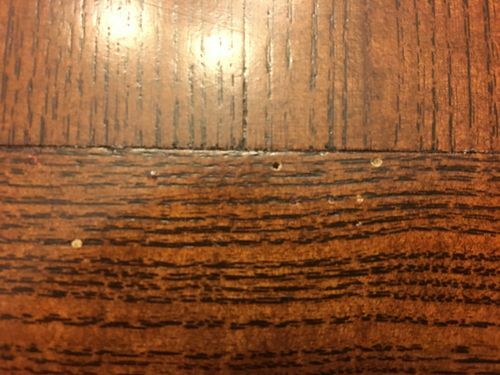 This indicates that PPB beetles can re-infest bare unfinished wood, including the holes they make themselves as they chew their way out. It also says that if the PPB infestation seems to be confined to a single board, then replacing the one board may be effective control. So as a minimum, I think you probably should consider taking the table and making a new BB end for it. This will let you check the ends of the other boards for tunnels as well. Thanks for the link Mike. I thought about replacing the breadboard if that’s only where they are. Would require matching the finish though which could be tricky. I haven’t had any experience with this before either but I’m going to be learning more in the coming days! Wrap the entire table in plastic. You may need several seams. It is key to make the wrap as airtight as possible. Place a handful of mothballs inside the wrap and seal it tight. Monitor the mothballs and add more as needed. After one week, the posthole beetles should be dead. Wow, you guys seem not very concerned for an issue that could result in a very expensive lawsuit. The beetles are obviously coming from inside finished wood meaning that they were there when you delivered the piece, sine it is true that they can’t infest wood through a film finish. But they can and often lay their eggs right back into the holes that they chew their way out of. The more important issue is that you introduced a pest into someone’s house that could ingest other parts of their home. 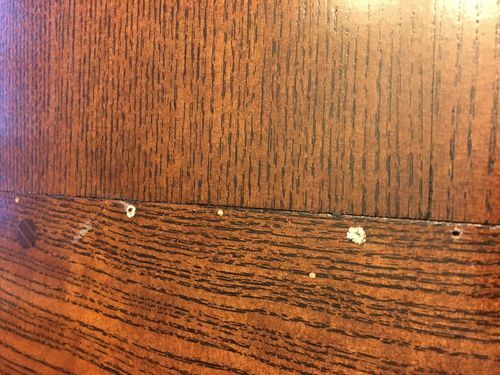 If their cabinets show beetle infestation next year, you might be held liable. The only good way to kill the beetles is to heat the center of the wood to 160 degrees. You can contact a local kiln and see if you can rent their kiln for a day and have them run a sterilization cycle for you. I had to get a 20’ shipping container and insulate it l, add heater ls and treat a few thousand board feet and everything I had when I got beetles. 5 years later, no sign of them. I also sent a wide slab maple table to my brother that could have had beetles so I found a local kiln and arranged for it to be picked up, heated, and returned and it turned out fine. The table may be destroyed, but you have not other option. You should immediately take it back and either make a new one or heat it to kill all the bugs and just pray that none of them that hatched infested another item in the house. Yep, after reading Matt’s comment, he beat me to the punch, heat is the best way to kill them, another option to try first is using a heat gun and going over the entire table making sure the heat is penetrating deep enough into the wood also hoovering the heat gun over the open holes as well. It’s apparent that the wood was not kiln dried to start less there would have been no beetles, might want to check your wood supplier to make sure they are kiln drying the wood and correctly. To kill PPB’s, the wood must be heated to an internal temp of 133 degrees and hold that for a few hours. I sterilize wood in a dehumidification kiln. By heating the air temp to 150 degrees and hold that for 24 hours, that assures that the internal wood temp will reach at least 133 degrees for the required time. I do not believe that mothballs will work. Any chemical has to penetrate deeply into the wood to kill any eggs or larvae. At a minimum, I would replace the breadboard. I’m not disputing the way to get rid of them, but they had to get in there in the first place. There should have been some entrance holes somewhere that were visible when raw. I’ve thrown more than my fair share of wood to the end of the driveway or into the woodburner when I found those little holes, even one or two, in a piece of wood I bought in a load, pulled out of a barn, etc. I know this is all hindsight, but I also went through this years ago, took the piece back and returned the money, piece went through the woodburner. Maybe you will get lucky with the help here. I didn’t have this kind of help in the 80’s and 90’s, but the beetles were still around. These fellows know their stuff. Use the help. Thanks for the feedback everyone. Does anyone have any thoughts on Bora-Care? I’ve been reading that it’s good for PPB and penetrates up to 4 inches into the wood. 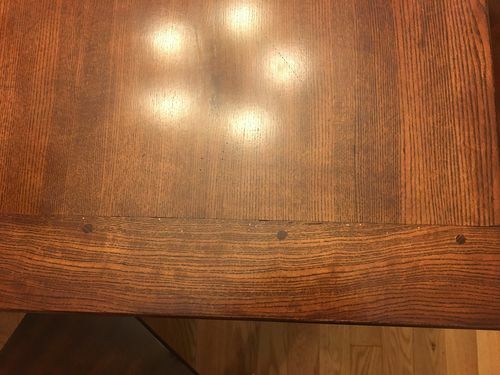 Could I sand the finish from the underside of the breadboard (or whole table), apply this stuff and refinish? I wouldn’t have to worry about refinishing the top or matching the finish on a new breadboard. But if the consensus is that this wouldn’t work I’ll look into the heat. Actually, there are no visible entrance holes with PPB. The adults lay eggs in the pores of the wood on the surface. One of the reasons they like ring porous woods like ash. You will not see or know if a board is infested for 6-12 months until you see he adults bore their way out. Applying urethane it the surface seals the open pores and does not allow the eggs to hatch and crawl into the wood. Learn something every day, Matt. I thought they bored in then laid eggs. So this must have been a fairly recent infestation on Dave’s table, less than a year. Yeah, I did a lot of research and there are good resources about the heating of wood to kill PPB from the Forest Service. I can’t remember the article, but it was a full paper on the topic with heating temperature charts and times for different wood species, thicknesses, temperatures, and moisture contents. One interesting thing is that when you have wet wood and you heat it in a dry environment (think regular hot air vs. steam) the moisture in the wood evaporates causing the surface temperature of the wood the be significantly lower than the air temperature. This can make the time to heat the wood interior much longer than if heated in a hot steam environment. I used a sample piece of wood that I would cut open or drill a hole into the center and stick a remote temperature probe into the hole to check the internal temperatures. Often it would take 24 hours for my kiln to come to temperature and heat a load to the required level. I then held it there for a few hours just in case the corners or some pieces were cooler than others. I found that ash, soft maple, and oak were the most affected. I found a few holes in some walnut, but mostly the sapwood, a some in a piece of okume marine plywood, and various other pieces of wood, especially old barn beams of beech and hickory. A lot just went right on the burn pile because I did not want to ever see a hole again. Thanks for the helpful information Matt. Any thoughts on the BoraCare option I mentioned above? Yeah, I did a lot of research and there are good resources about the heating of wood to kill PPB from the Forest Service. I can t remember the article, but it was a full paper on the topic with heating temperature charts and times for different wood species, thicknesses, temperatures, and moisture contents. One interesting thing is that when you have wet wood and you heat it in a dry environment (think regular hot air vs. steam) the moisture in the wood evaporates causing the surface temperature of the wood the be significantly lower than the air temperature. This can make the time to heat the wood interior much longer than if heated in a hot steam environment. I used a sample piece of wood that I would cut open or drill a hole into the center and stick a remote temperature probe into the hole to check the internal temperatures. Often it would take 24 hours for my kiln to come to temperature and heat a load to the required level. I then held it there for a few hours just in case the corners or some pieces were cooler than others. I would replace the breadboard first and see what happens. It may be the only board in affected. Yes, heat works. Still, I have used mothballs placed in an airtight enclosure (a loose wrap of painter’s plastic sealed with duct tape) and it is easier. Mothballs will kill everything. I enclosed about 200 bd ft of ash with mothballs about 2 years ago and I am still using it. No signs of beetles. I encourage you to experiment with the breadboard first. If you are uncertain, allow a two week kill time. If you decide to replace the entire item keep it and experiment with this method. I’ve killed a lot of these things before starting a project, I’ve never had an issue afterward. I don’t have any good advice except to also say that heat is the only surefire way you can kill everything – grown bugs, larvae, eggs. I could be wrong but I don’t believe mothballs can do anything to eggs. You need something to kill at every stage because you don’t know how many are left, if any. The last thing you want is more to come out and then infest the house. Google Texas A&M and powder post beetle and see if you can find a contact to email. They know a lot about these bugs.